Onebillion, a not-for-profit developer and publisher of educational apps, wanted to develop a solar-powered projection solution to transform the education of one billion marginalised children. Challenge: Onebillion, a not-for-profit developer and publisher of educational apps, wanted to develop a solar-powered projection solution to transform the education of one billion marginalised children. 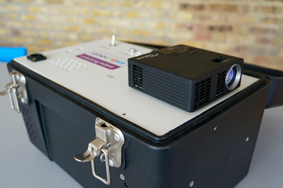 Solution: With the help of Cambridge-based engineer, Chris Moller, onebillion created a portable energy efficient solution with Optoma’s ultra mobile LED ML750e projector. It installed this in a sturdy case with an Apple TV media streamer and an amplified speaker system. Onebillion, a not-for-profit developer and publisher of educational apps, wanted to find a way to help Malawian teachers educate children with the help of technology. • Class sizes reach 100 pupils on average and up to 300 pupils in some schools. • Very few schools have electricity. • Textbooks are scarce. Even where they exist, they fall apart in the heat and humidity. It wanted a solar-powered projection solution that would enable teachers to share material with every child in the class. As well as creating the portable energy efficient solution, it would produce a set of high-quality resources on a variety of topics that can be operated from a tablet and connected to the projector. Teachers would have access to a curated set of engaging and valuable apps, videos and books. These apps help children to learn key skills of numeracy and literacy in both their own language and in English. Chichewa is the official language of Malawi, spoken by over 57% of the population. Onebillion’s ambitious goal is to transform the education of one billion marginalised children. It has already established five oneclass learning centres in Malawi, with another 200 classrooms planned nationwide, providing apps in the local language, on solar powered tablets. It works closely with volunteer charity, VSO, to bring transformational learning to all primary school children in Malawi. With the help of Cambridge-based engineer, Chris Moller, who donated his time to build prototypes, onebillion created a solution with Optoma’s ultra mobile LED ML750e projector. Jamie Stuart, Chief Technology Officer of onebillion, said: “We tested a selection of ultra mobile projectors before we chose the Optoma projector but either they were not bright enough, did not have audio out or they were not energy efficient enough”. LED projectors use less energy than traditional lamp-based models and the perceived brightness from LED projectors can be twice that of an equivalent lamp-based model. 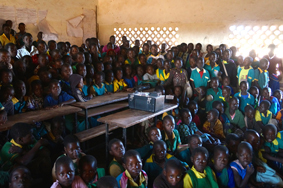 Fortunately, Malawian classrooms are kept fairly dark to keep them cool – so the 700 LED brightness of the ML750e is just right. Weighing just 380g, this ultra mobile HD Ready little projector, with WXGA resolution incorporates a media player, native office viewer, built-in speaker and HDMI connectivity. Projection without a laptop is straightforward using the built-in memory, a microSD card slot or USB connection. 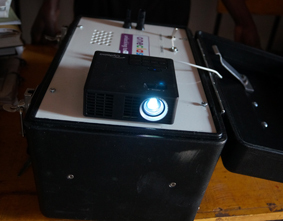 The bright, yet low-powered LED projector was connected to a long-life battery that enables the teacher to use the unit with their class for up to five and a half hours on a single charge - enough for a whole school day. It has multiple charging options: solar power, a car battery through the lighter socket, a mains adapter or 24V DC from the solar cabinet of a oneclass learning centre. Within the unit an Apple TV media streamer is installed. This allows teachers to use AirPlay to stream material from an iPad Mini and share this with the whole class. The unit also has an amplified speaker system so every child can hear audio in a class. 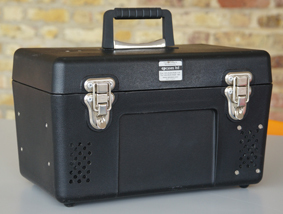 And this is all fixed securely in a sturdy case, donated by CP Cases, to protect the whole system from the elements and regular use. The system draws as little power as possible. Teachers only need to press on/off and the hardware works together as soon as it gets signal. The ML750e has an audio output allowing external speakers to be connected. This enables the teachers to get the additional volume needed when so many children are in the class. As well as use within the schools, the unit can also be taken out to help communicate essential messages to isolated communities on topics such as health care, contraception and disease prevention. Both the projector and iPads are charged overnight. These mobile devices can also be updated remotely. This allows onebillion to supply new material, for example on Malaria prevention, onto teachers’ tablets from the UK. Most schools have no electricity but they do have access to the mobile network. Mobile operator Airtel donates bandwidth for these iPad updates overnight via the network. Andrew said: “With class sizes usually over 100 - and sometimes as many as 300 students, and with few resources, the job of a Malawian teacher is really challenging. 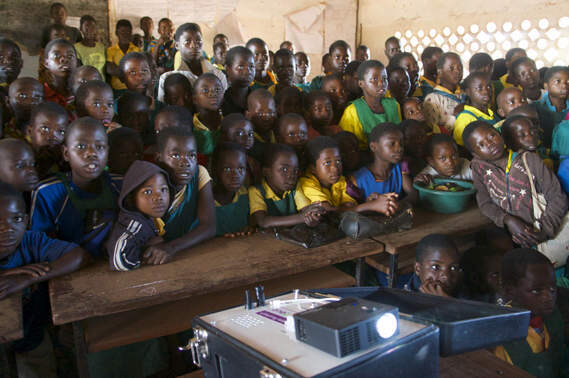 With our portable solar-powered projector, we can provide them with high quality resources that can be projected to every child in their class. “The ML750e just works. We are delighted with the projector. It has already been all around Malawi and is proving itself to be robust and reliable. “It is simple for teachers to use and gives them the resources to be able to reach and teach more children. Onebillion will be presenting the projection solution to the Malawi Institute of Education and Ministry of Education officials at a conference on publishing educational material in Lilongwe, Malawi, in September. It will demonstrate the functionality of apps with a class using tablets in their own language. 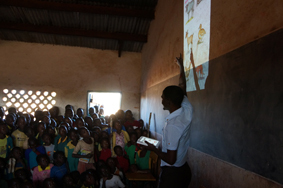 It will also demonstrate the projector with a Malawian teacher sharing content with a large class. Onebillion will then be taking the projector to India and Uganda in October with a view to rolling the solution out to more countries. Onebillion relies on donations and support to continue its work helping marginalised children. Using Malawi as a model of what is possible, it is onebillion’s goal to expand to other countries around the world, and unlock the potential of one billion children. This can only happen with the combination of a solid evidence base, committed partner organisations and donor engagement.